Cultures around the world have practiced massage for several millennia and yet, researchers and practitioners still haven’t learned all the benefits of a long-term massage regimen. However, a significant body of new research suggests that regular massage offers even more advantages than infrequent sessions. If you’re not doing so already, here are seven more reasons you should consider adding massage treatment to your monthly calendar. Numerous studies have confirmed that massage as instrumental in reducing stress. For example, a 2016 Journal of Clinical Psychiatry study revealed that anxiety disorder patients who receive massage therapy show a substantial reduction in symptoms. Researchers attribute this improvement to the “feel good” chemicals — endorphins, serotonin, and dopamine that the body releases during and after a massage. It’s no wonder therapy patients who make regular appointments to their massage therapists report a drastic reduction in stress. Massage therapy is the perfect way to relax those sore muscles. Whether the soreness stems from an intense workout or sitting in front of the computer for hours on end, there’s nothing better for pain relief than a great sports massage. We tend to carry a lot of tension in our neck and back muscles. As such, these muscle groups require special treatment which is why many practitioners advocate monthly treatments as opposed to periodic or single visits. Many of our customers get monthly Swedish and Deep Tissue Massages. Our muscles and organs need oxygen to heal and function properly; this is one of the key benefits of massage since it stimulates blood flow. Massage therapy helps provide oxygen and other necessary nutrients to our blood. In doing so, it relieves back pain, heals sore muscles, and is beneficial for one’s overall health and well-being. These benefits are heightened by getting regular massages. Many Americans suffer from lower back pain. We tend to hurt our lower back muscles one of two ways—sitting at a desk all day or working out at the gym. As a result, our back muscles get tense from repetitive use or overuse. Getting regular professional massages is one of the best ways to properly relieve tension and lower back pain. Apart from helping manage stress and anxiety, a massage can also be instrumental in lifting your spirits. Since our brains produce happy chemicals such as serotonin, dopamine, etc. during a massage session, anyone suffering from high anxiety levels can benefit. If you’ve ever seen our customers leave our massage spa, this is why. And if a single massage can improve your sleep, imagine what monthly massages can do. Fibromyalgia is a long-term condition that causes widespread pain and is often accompanied by mood swings and sleep issues. In some instances, it causes fatigue and flu-like symptoms, as well. Those who suffer from this condition may sometimes feel stiffness and pain in their back muscles. Fortunately, it’s nothing that a monthly trip to your massage therapist can’t address. Sleep is critical for good health. Whether you’re having a difficult time falling asleep or just having a difficult time sleeping through the night, a massage acts as a holistic sedative and rivals any sleeping pill. Massage helps patients sleep because it aids in the body’s release of serotonin. Since regular therapy means a steady flow of neurotransmitters, monthly massage all but assures good sleep – night after night. As the research and data accumulate, we’re bound to learn even more benefits of monthly massage but for now the items above are reason enough to consider converting those one-off massage sessions to monthly visits. We offer many more types of body massages and our signature foot massage at Treat Your Feet Buckhead. Swedish massage treatments can be a vital tool in delivering pain relief to rheumatism or degenerative joint disease sufferers as it promotes circulation, relieves aches and reduces stiffness. This form of massage works on the top layers of tissue; in doing so it addresses persistent knots and stiffness. The strokes fall under one of five different categories. Effleurage – Consists of sliding and gliding movements to relax the body’s muscles. Petrissage – Uses kneading motions to penetrate the muscles beneath tissue. Tapotement – Utilizes rhythmic tapping motion to improve blood flow. Friction – Uses heat to relax the body’s muscles. Vibration – Aids in loosening your muscles through shaking movements. An experienced massage therapist can apply any of the above movements to the recipient’s hands, neck, back, and shoulders to reduce inflammation or any other arthritis-related conditions. Suitability: Swedish massage tends to work best for individuals suffering from lack of sleep, general stiffness, or anxiety. Although in concept it is similar to Swedish massage, deep tissue massage applies greater pressure and targets deeper layers of muscle; this makes it ideal for sports injuries, as well as chronic conditions. However, while some forms of massage are better suited to addressing joints and top muscle layers, deep-tissue massage techniques provide healing benefits to the body’s fascia, which is the tissue that connects your muscles, bones, arteries, and organs. Deep-tissue massage utilizes sustained pressure and deep strokes to address specific problem areas. Although often less comfortable than other forms of massage, when performed by a professional therapist, the ultimate benefit of a deep-tissue session is arthritis relief. However, this isn’t the only advantage. Suitability: While effective, not everyone is suited for deep tissue massage. For instance, those who are new to massage may want to opt for another form of therapy before moving to deep tissue massage. Hot stone massage therapy dates to old China. The ancient Greeks and Romans also practiced several variations of stone massage therapy. Likewise, there are records of the technique being practiced in several ancient Middle and Near Eastern cultures, as well. Although there are many variations of hot stone therapy, the method that most therapists practice today is similar to what traditional Chinese healers have utilized for some 2000 years. The treatment is administered by placing smooth, heated stones to key pressure points along the body. As heat radiates from the stones, the recipient experiences deep relaxation and improved blood circulation, along with arthritis relief. Suitability: Anyone with open sores, chronic skin ailments, blood or heart conditions is discouraged from using stone therapy. The bottom line is that although there are many natural remedies for arthritis, the aforementioned techniques are among the most promising. And remember, if you’re unsure which form of massage to choose, a good therapist can point you in the right direction. Not so long ago, getting a professional massage was outside the reach to the average American. It was “exclusive,” considered primarily for leisure. However, massage continues to morph from a luxury to a recognized form of complementary and alternative medicine (CAM). In fact, a 2003 American Hospital Association (AHA) survey reveals that of the of 1,007 responding hospitals, 82% include massage therapy as part of their CAM healthcare offerings. Massages have also become more affordable for everybody in the United States. Take a look at our massage pricing for example. Massage involves the therapeutic manipulation, rubbing, and pressing of soft tissues (muscles, ligaments, and tendons) using the fingers, hands, forearms, elbows, knees, feet, etc. Thanks to a recent rise in popularity, there are now over 80 variations of massage therapy to choose from, each offering a wide variety of movements and techniques. Indeed, the industry has developed to the point where you now have some categories of massage movements that cater to the entire body, while others are almost exclusively recognized as being suited for isolated muscle groups. Massage is among the most relaxing and soothing sensations one can experience. However, the benefits of a good rubdown go beyond relaxation and run deeper than you might think. A recent study that appeared in the American Massage Therapy Association (AMTA) publication indicates that 50% of adults who saw a professional massage therapist in the past year did so for medical or health reasons. In contrast, only 28% of massage consumers sought massage for relaxation or stress reduction during the same period. So why are so many patients turning to massage therapy? Let’s review the health benefits to find out. For centuries, people have turned to massage as a way to de-stress. Indeed, recent studies confirm that massage significantly reduces physical and psychological stress. Clinical studies show that massage therapy increases production of endorphins (natural chemicals that make you feel good), serotonin, and dopamine; while it reduces cortisol levels, heart rate, blood pressure, and oxygen consumption; factors typically associated with stress. That heightened sense of elation after a massage isn’t just in your head. In fact, several recent studies confirm that researchers can actually measure the impact that massage has on individuals experiencing emotional trauma. Likewise, massage has also been shown to bring about a corrective effect for those suffering from deep anxiety. As a case in point, a 2004 study published in the Journal of Psychosomatic Research, shows that women with breast cancer who received massage therapy had decreased levels of anxiety and hostility. The complexities of modern suburban life has made Americans more tense than ever—both psychologically and physically. As a result, back injuries, joint stiffness, and muscle tension is ever on the rise. Unfortunately, this is a trend that medical experts don’t see changing. However, one factor that could soften the impact of muscle stiffness is therapeutic massage. For example, techniques such as Swedish massage, have a proven track record of loosening muscle groups and relaxing stiff joints. Maintaining good health is impossible without adequate sleep. The good news is that researchers have confirmed that massage therapy may significantly reduce the incidence of sleep insomnia. Furthermore, the effect of massage therapy on sleep isn’t limited to any one age group. A 2006 study by researchers from the University of Warwick found that massage helped infants aged six months or less sleep better and cry less. Testing in adults proved similar results as evidenced by a University of Miami School of Medicine study. These studies have also confirmed that massage promotes better sleep because it aids in the release of serotonin, which helps the body achieve a state of restfulness. Massage helps you rest by reducing the cortisol level and triggering several brain chemistry responses which translate into extended periods of deep relaxation. The body of evidence that supports using massage for the treatment of pain at the muscles and joints is rock solid. Whether it’s chronic back pain, knee osteoarthritis, hand arthritis, or any other form of rheumatism; evidence suggests that massage not only reduces pain but improves range of motion and overall function. There was a time when adults were highly mobile throughout the day. However, given the amount of time that we spend straining our necks and backs using mobile devices or sitting at our desks those days are long gone. Sadly, many adults have lower back pain for life in the information age. According to the American Academy of Family Physicians, back pain sufferers experienced more comfort from therapeutic massage than those who were given a placebo. Massage has long been thought to reduce depression. But several recent studies provide conclusive proof that therapeutic touch relieves those who suffer from depression. Furthermore, there is research which validates the impact of massage therapy in alleviating perceived pain and anger. reducing the frequency, intensity and duration of anxiety attacks and mood swings. Therapeutic massage facilitates blood circulation by directing oxygen and nutrient-rich blood to and from our muscles and internal organs. In turn, this improved blood flow leads to growth, recovery, and healing throughout the body. A 2014 study that appeared in the Archives of Physical Medicine and Rehabilitation found that massage therapy improved general blood flow. An earlier study published in Medical Science Monitor by Japanese researchers offered a similar conclusion. Before massage therapy began making inroads in the medical sector, pro athletes and coaches had already adopted massage therapy as part of their fitness regimens. While evidence was initially scant, new studies backed by reputable sources are firming up the effectiveness of massage therapy in sports, thanks to its proven impact on medical test subjects. The benefits don’t end with the list above. There are many others. For example, recent studies have documented a correlation between therapeutic massage and improved cardiovascular health. For instance, a study published in the International Journal of Preventive Medicine confirms a noticeable dip in blood pressure after a professional massage session. 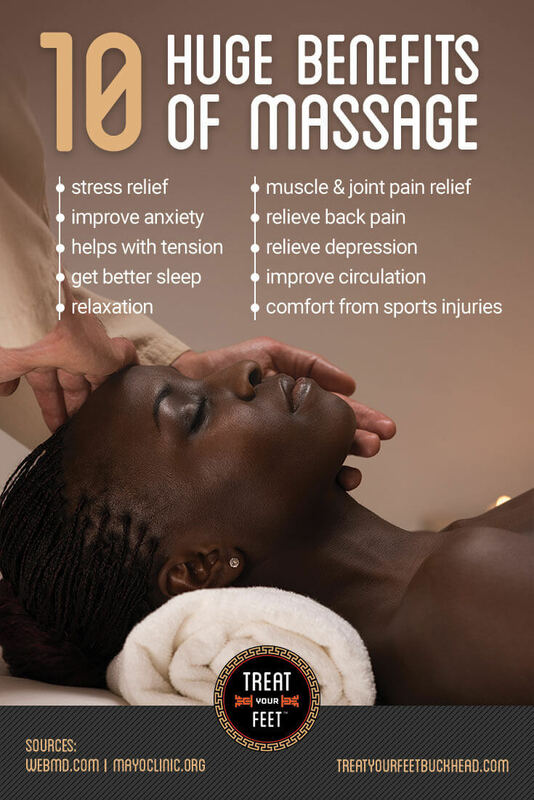 There are many other benefits of massage. However, the points above are among the most cited.